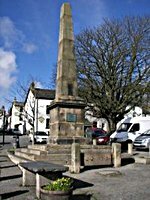 Broughton Tourist Information Centre for advise on accommodation, Self Catering, B&B, pubs, local shops, where to eat and drink and helpful advice on holiday attractions activities and adventure in the Lake District. Broughton in Furness is in the Southern Lake District. Broughton-in-Furness is situated on the Duddon Estuary an ideal base for visiting the Lake District.